Anbar is not the only front in Iraq on which Al Qaeda in Iraq (AQI), now operating as the Islamic State of Iraq and Sham (ISIS), is fighting in 2014. 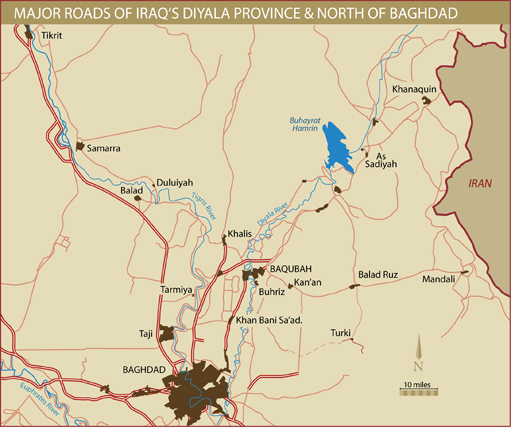 ISIS has also established a governorate in Diyala. Its spokesman has named the province the central front in the sectarian conflict he has urged. In this six-part interview, ISW President Kimberly Kagan discusses MND-N with BG James C. Nixon. Operation Glad Tidings of Benevolence was an Iraqi operation carried out in tandem with Operation Iron Pursuit designed to pursue insurgents in rural areas of Diyala province. Maliki and the Iraqi Islamic Party (IIP) face-off in the run up to the Provincial Elections in Diyala Province. Operation Sabre Pursuit was an operation in eastern Diyala Province which cleared villages outside of Diyala's major population centers.